T Joe Thomas vs. 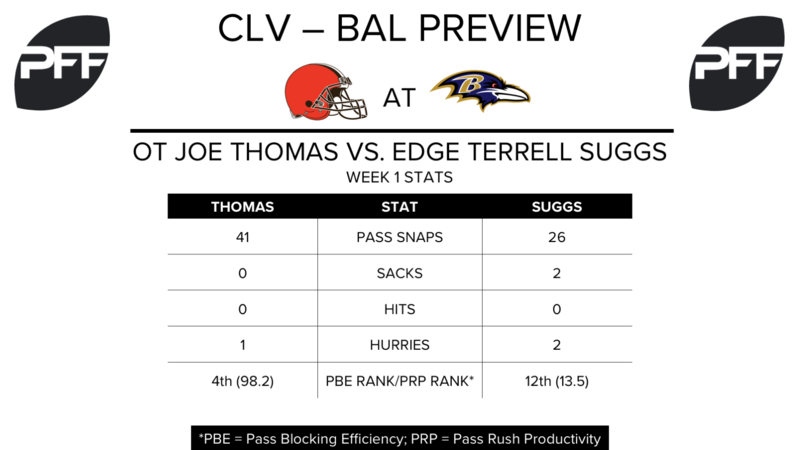 EDGE Terrell Suggs — Suggs kicked off the 2017 season on the right foot, recording two sacks and four total quarterback pressures in 26 pass-rush snaps against the Bengals on his way to an 85.7 overall grade. As a primarily right-side rusher (77.8 percent of pass-rush snaps from the right side in 2016, 76.9 percent in Week 1), Suggs will spend the bulk of his day matched up with a familiar foe. Thomas was excellent, as usual, against the Steelers, allowing just one pressure in 41 pass-block snaps. In 803 pass-block snaps against the Ravens over his career, Thomas has allowed just four sacks. QB DeShone Kizer vs. S Eric Weddle and Tony Jefferson — Kizer was an excellent deep-ball thrower in college, posting passer ratings of 112.6 and 111.5 on passes traveling 20 yards or more in the air during his final two seasons at Notre Dame. Kizer found similar success in a small sample during the preseason, connecting on 4-of-11 deep passes (plus one drop) for 149 yards, one touchdown, and no interceptions, good for a 114.8 passer rating. It was a different story in Week 1, with the rookie quarterback completing 2-of-6 deep passes and throwing an interception against the Bengals. Facing off against one of the league’s best safety tandems this week, Kizer could be hard pressed to generate big plays in the passing game for a second consecutive week. HB/WR Duke Johnson Jr. vs. CB Lardarius Webb — Johnson didn’t line up in the backfield on a single snap in Week 1, instead spending his day as a wide receiver and aligning in the slot on 45 of 50 snaps. Hue Jackson insists Johnson remains a running back, but it’s seems safe to assume he will continue to be utilized heavily in the slot, even if he spends less than 90 percent of snaps there going forward. After spending last season at safety, Webb has transitioned to a slot cornerback role this season. It was a rocky start for the veteran defensive back, who earned a 47.9 overall grade in the season opener while aligning in the slot on all but two of his 46 snaps. QB Joe Flacco vs. S Derrick Kindred – Kindred was one of the few bright spots for the Browns defensively against the Pittsburgh Steelers last week. Kindred was targeted once in primary coverage and had a pass defensed. He also picked off Ben Roethlisberger on a deep pass to Martavis Bryant. Flacco, who attempted the 11th most deep passes (20-plus air yards) in 2016, will need to decide if he wants to attack Kindred or is better off working underneath against the Cleveland secondary. WR Mike Wallace vs. CB Briean Boddy-Calhoun – Wallace, who lines up primarily on the outside, will matchup often this week against Boddy-Calhoun, who had a dominant Week 1 against the Steelers. Boddy-Calhoun’s average of 33 coverage snaps per reception allowed ranked sixth among cornerbacks last week. Wallace earned a grade of just 48.1 against the Cincinnati Bengals, and will look to bounce back this week, though seeing Boddy-Calhoun at least half the time won’t make it easy. 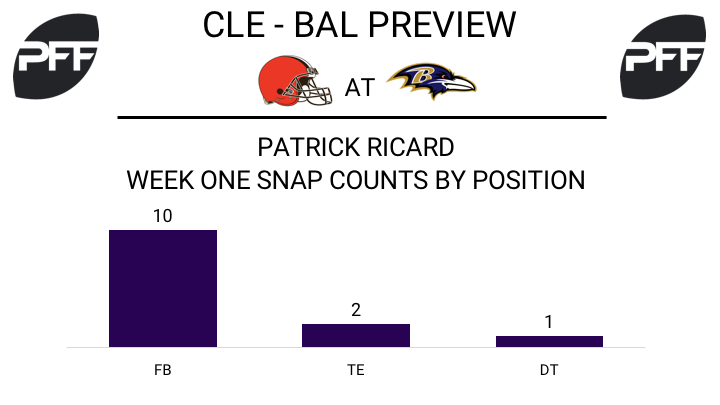 FB Patrick Ricard vs. LB Christian Kirksey – The converted defensive lineman is now playing both ways for the Ravens, and Ricard showed week one he can block effectively in the run game. Ricard was the highest graded fullback in the league last week, with a grade of 75.1. His run-blocking grade of 75.1 ranked second only to former Raven and current San Fransisco 49er FB Kyle Juszczyk. Ricard will see Kirksey often, who had two stops in 17 run snaps last week.